My second week at Wale went by faster than I could think. Together with Venna, Evette and Happiness, the week started with a morning-Monday-meeting to discuss our weekly plans. From English classes, over career workshops to a few fun activities and a solid Saturday’s programme for the kids at the center. Not to forget the bunch of weekly tasks concerning project management and administration, such as writing a project proposal and looking out for future partnerships. All the office moments as well as the afternoons with the kids were filled with a whole lot of joy and laughers. By reading together and supporting them in learning how to find their very own way through their homework, I could instantly witness the progress each of the kids has made individually. Even in those short two weeks. What followed on Monday was one of the most valuable experiences to me, a walk through Kibera, accompanied by my lovely colleague and friend Evette. I really enjoyed the little guided tour through Nairobi’s chocolate city within a city. I have to admit though, what played a huge role was the warm summer breeze this day, which I have missed so far. Beyond the weather, it is Kibera itself, a “jungle” that is chaotic but vibrant, a creative and community-driven space, that changed my perspectives. If you have a look at current media representations or even humanitarian communication, you will always come across that image of the hopeless, poor and dirty slum, with the same hopeless, poor and probably uneducated African women, men and children. Stereotypes that are only black and white. No nuances to be found. You cannot deny, that a lot of its people live below the poverty line and have no access to the very basic needs. And yes, waste management in Kibera is not at its best. The urban informal settlement certainly lacks institutional structures and a competent national as well as local governance that distributes resources equally and invests in sustainable state planning. But who is to blame? And is the unfortunate situation of poverty the only thing that defines the people who live in informal settlements like Kibera? Some theories I have come across before that push this deep-rooted myth that “slum-dwellers” are responsible for their own unfortunate realities, really hit me as untrue and unfair as I spend time with the kids who are born and live in Kibera. Despite of all, if you look into the faces of all those people finding their ways through Kibera, and if you look into the cheeky faces of the kids at the center, you find smiles and moments of happiness. Smiling, dancing, playing on the doorsteps of their houses and on the doorsteps of Wale Wale. You find human beings. Ordinary people like you and I. We should question our belief-system that sets financial wealth equal to happiness. You could only guess how rich or poor someone is. On the other side it has been very clear to me from interactions at Wale that there is no need to pity anyone, anywhere. Personally, pitying someone has always given me the impression of inequality, of looking down on someone, of not being on par with each other. Of course, I would not go so far as to say that people of Kibera willingly choose poverty and find it super amusing after all. Obviously, it is not hard to find people in a slum that find their circumstances hopeless and turn their paths to social degradation, violence and criminality. Structural inequalities, youth unemployment in particular, and social exclusion are not far from reality. What you will find next to those people, is an even more dedicated, hard-working and life-enjoying community. Hustling everyday and every day. Kids going to school, playing on the streets, building toys and footballs out of whatever they find. Men and women working, like everyone else does, selling everything from Mandazi to furniture, and simply having a family. Being poor does not necessarily mean to be lazy, diseased, criminal, a drunk or drug addict, a prostitute or whatever prejudice is out there. You find so many people hustling next to each other, close together on smallest spaces available, that seems to translate into a community-driven spirit. Communal solidarity. I do not want to romanticize Kibera, look away and ignore that a thousand of one room apartments do suffer from shortages of food and basic sanitation, domestic violence or petty Exploitation and much more. But there is more to it. There is another side to the story. A side that I have been able to see through the eyes of the youth and staff of Wale Wale Kenya. 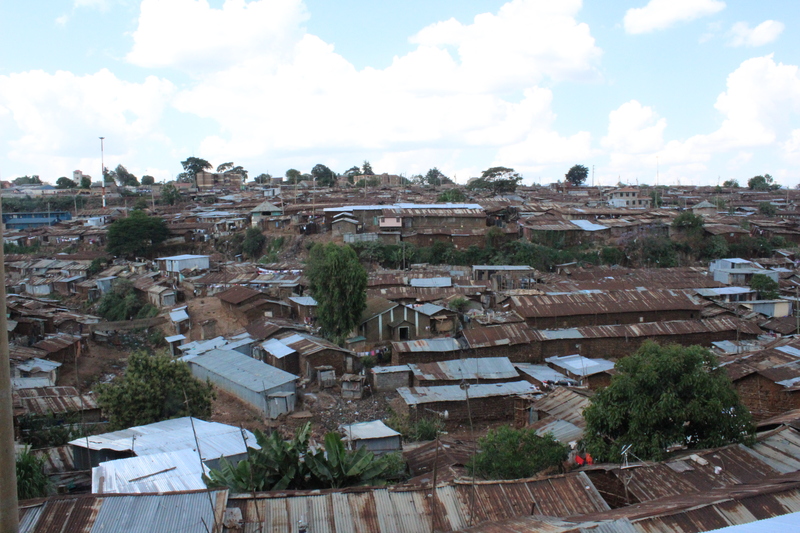 Kibera is a place often understood as hopeless, yet carrying even more potential in it. It’s the people themselves and their meaning of agency, ownership at participation that contributes to constant upgrading of Kibera’s corners. At least what my eyes could tell me. What my eyes could also tell me is the hospitality of Kibera, of people I came across. People that are down to earth. As you can hear, well read, my walk through Kibera, although short, was one of the most shaping situations during the last week. Food for thought-wise. Other than that, what motivated me this week were a Salsa-evening together with Venna in Nairobi city center and a Yoga session by Africa Yoga Project on Saturday morning. On my free day on Sunday I visited a tea farm in Limuru, surrounded by a beautiful green landscape. Taking three Matatus and two ‘bodabodas’ to get there was an experience for itself, with matatu conductor letting my wait for 30 minutes in a Matutu and trying to convince me to take a direct “Express” route as part of a surprisingly overpriced deal, with people asking me if I would be joining for church in Limuru, and with people could not believe that I could speak a bit of Kiswahili, even if it is limited to the basics. In the end, I was lucky to have one of the most impressive bodaboda trips through the wideness of those tea fields. Also, the local staff at the team farm gave me a few insights on some Kikuyu beliefs and traditional medicine with a walk through the forest, which I won’t forget. I am hungry to learn more.